The second day of the CNBloggerCon 2008 started with the long awaited keynote speech from our China 2.0 participant Shel Israel. He presented "8 Stories of Global Social Media" and you can find a summary of the speech from the CNReviews guys here http://cnreviews.com/cnbloggercon/shel_israel-2_20081116.html as well as Shel's presentation below. Additionally, thanks to Netease, you can review all sessions on video. 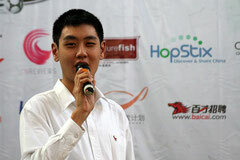 In the afternoon we had David Feng as a second China 2.0 Tour participant on stage to speak about international Chinese. David Feng is the President of the Beijing Macintosh Union and the Beijing Macintosh User Group, Publisher of techblog86, a tech, mobile and enterprise blog, and the founder of Beijingology, a blog and a wiki about the city of Beijing. He is also the author of The Beijingologist blog on City Weekend, a co-blogger at CNReviews, the tech editor at Shanghaiist, a columnist at Macsimum News and a regular guest on Radio Beijing (AM 774). You can also review his speech in the afternoon session below. There is also a great wrap-up post on the entire China 2.0 Tour and the CNBloggerCon from David Feng here.